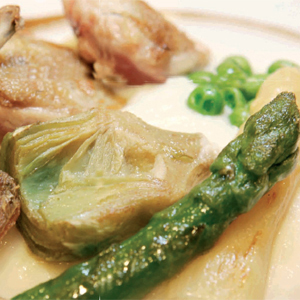 Recipe from the Kabanova restaurant, Logroño (La Rioja). The cauliflower: Clean and cook the cauliflower with a pinch of salt. Drain well and mash with the milk. Season to taste. Meanwhile, cook the peas and then the artichokes, cleaned and cut in half. The quails: Separate the breasts and the thighs and remove from the bone. Fry the thighs in plenty of oil, and brown the breasts lightly in a frying pan. Use the same pan to brown the white and green asparagus. The sauce: Braise the quail carcasses, add the diced onion and cover with water. Reduce until you have a concentrated sauce. Arrange a bed of cauliflower purée on the bottom of the dish and scatter the vegetables over it, distributing the different colours evenly. Finally, top with the quail and drizzle with the sauce.